Ft. Lauderdale Shooter “Jason Bourned” with Mind Altering Drugs and ISIS Indoctrination – Coercion Code – "Dark Times are upon us"
(NaturalNews) The playbook of the globalists is so obvious now that it’s all right out in the open. After a parade of false flag shootings enhanced with completely faked (staged) elements — such as professional actors playing the roles of grieving parents — most of the informed people in the world now know that everything is faked in the mainstream media. Search GoodGopher.com for the term “crisis actors” by clicking here. You’ll be astonished at what you learn. Case in point: The “sloppy sniper” from the Sandy Hook event. This “sniper” was actually a professional actor named David Wheeler. He also played the role of a grieving parent for CNN’s camera. Hilariously, he carried around a sniper rifle by clutching the magazine… something no real sniper would ever do (but few people who aren’t familiar with sniper rifles would ever notice). It’s all so hilarious: Even the AR-15 on his chest is flipped around backwards, for a leftie. Anyone familiar with actual firearms can look at this guy and know he has no clue how to handle firearms. This entire topic of fake news, staged events and false flag shootings was considered “loony conspiracy theory” just two years ago. But now, after watching the depths of fakery, false news and total fabrication of events being pulled off by the Washington Post, NYT, CNN, MSNBC, etc., everybody is waking up to the realization that the “news” is just another name for the wool that’s being pulled over our eyes to blind us from the truth. The truly loony conspiracies are being pushed by the Washington Post, which knowingly fabricates false news and then gets repeatedly caught doing so. In just the past few weeks, the Washington Post has completely fabricated a loony conspiracy theory about the Russians “hacking” the U.S. election as well as a totally made-up story about Russian hackers “penetrating” the U.S. power grid in Vermont. In both cases — and many more — the WashPost literally just “made s##t up” and printed it as fact. When it comes to gun control or domestic terrorism, there’s nothing the corporate controlled media won’t fake, stage, distort or fabricate to push their agenda of disarming the citizens (an obvious prelude to totalitarian government control of the citizenry). To provide the narratives to the media, the deep state runs gun control false flag operations to give the faked media something to “whip up” as a form of journo-terrorism (to terrorize the American people). So how do they pull off gun control false flag operations? First, they have to train people to carry out the shootings. And that’s where our Ft. Lauderdale shooter, Esteban Santiago, enters the picture. Santiago told agents that US intelligence had infiltrated his mind and were forcing him to watch ISIS propaganda videos. 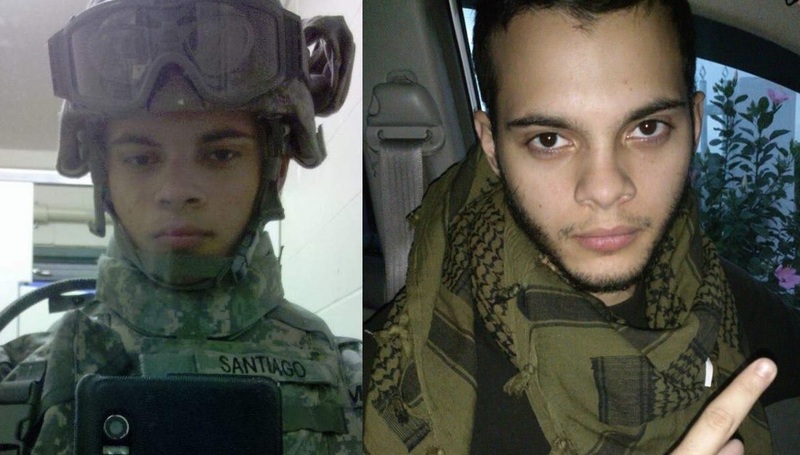 “In November 2016, Esteban Santiago walked into the Anchorage FBI Field Office to report that his mind was being controlled by a U.S. intelligence agency,” a senior federal law enforcement official said. It’s no coincidence that this is one of the first phases of creating a “Manchurian Candidate” type of human pawn… a “Jason Bourne” mind control subject who can be used by the deep state as a weapon to carry out executions, mass shootings, suicide bombings or other forms of mayhem that achieve a political or social purpose. Santiago was born in New Jersey and his family was originally from Puerto Rico–where he served in the Puerto Rico National Guard. He was in the Army Reserves prior to serving in the Alaska Army National Guard. According to reports, he was honorably discharged four months ago from his last post at Fort Greely, Alaska, and his military rank at that time was E3 (Private First Class). Typically, “Jason Bourne” candidates are heavily drugged with psychiatric drugs in order to blur the lines between fiction and reality. Often, the drugging begins with selected soldier candidates even before they are discharged from the military. This is done for all the obvious reasons: The psychiatric drugging takes place offshore, out of the domain of U.S. medical ethics oversight, and the military has no requirement to heed such boundaries in the first place. “He lost his mind,” Ruiz said in Spanish, as she referred to a psychiatric hospitalization that occurred after he allegedly suffered from hallucinations. After Santiago’s military service in Puerto Rico and Alaska from Dec. 14, 2007 to August 2016, the former Army private first class was still undergoing psychological treatment, according to relatives. This is exactly how the deep state builds a Jason Bourne: They pick an obedient soldier, drug him into oblivion, force him to watch ISIS propaganda videos, indoctrinate him with images and directives to carry out mass killings, and then keep him drugged with ongoing “psychological treatment” until he’s needed for a desired mission. Once the mission is approved, the mind controlled puppet is unleashed onto the public to commit the mass murder, then is immediately arrested or executed to make sure the narrative is controlled and concluded. If taken alive, he is then heavily drugged into a state of insanity, making sure he can never utter a coherent thought again. Or, if he is somehow allowed to talk to reporters or appear on camera, he will appear completely insane due to the relentless drugging. All court proceedings are handled in a secretive manner to make sure no real investigations can take place. This is precisely what happened to the “Batman theater shooter” James Holmes, who reportedly carried out a mass shooting in Aurora, Colorado, at the height of the Obama regime’s gun control hysteria. Notably, James Holmes was heavily medicated before the attack with antidepressants and hypnosis drugs. In addition, he was also under the psychiatric “care” of the United States Air Force, which kept him drugged. As always happens, a judge quickly slapped a gag order on the Holmes legal case, preventing anyone from discovering details about how Holmes was handed a scripted blueprint of the attack while being drugged into obedient compliance.